We’d just finished riding up the Tourmalet, known as one of the toughest Tour de France hill climbs – it would be more accurate to say I crawled up – when my youngest brother Sam made a prophetic suggestion. “Why don’t we follow Hannibal’s trail on bicycles and make that into a TV documentary?” Sam’s Hannibal idea seemed brilliant and preposterous at the same time. Brilliant, because the three of us are ancient history nuts (Sam is also an archaeologist). Preposterous, because it’s well known that Hannibal, one of the greatest military commanders of all time, led an army with nearly forty war elephants from Cartagena in the south of Spain, up the coast, over the Pyrenees mountains, through France, across the Rhone river, over Europe’s biggest mountain chain, the Alps, down Italy and finally back to his homeland, Carthage, now modern day Tunisia. That’s more than two thousand miles of cycling and how were we supposed to get over the Alps on bicycles? In your dreams mate. Two years after our Pyrenees holiday, the dream was a reality. We were in Cartagena, former capital of Carthage’s Spanish empire, ready to start filming with a BBC film crew. The basic concept: ten weeks on the road telling two epic stories: Hannibal’s war against ancient Rome mirrored by our cycling adventure. The idea was to mimic Hannibal’s real life journey as much as we could so that our daily cycling became like Hannibal and his army enduring the privations of the forced march. We’d carry all we needed like maps, clothes, cooking equipment and tents in our panniers on the bikes and apart from the filming, cycle about fifty miles a day. We’d try and recreate the struggle of his river and mountain crossings on our bikes and stop in key places on his journey, like battlegrounds, ancient ruins and now modern towns, to tell the story of his invasion of Italy in 218 B.C. During this pregnant pause I considered the parallels between us and Hannibal’s army. Like his Numidian cavalry, who were regarded as the best in the ancient world, we were proud of what was between our legs: in our case, touring bikes. Four panniers, or small suitcases, were fixed to the frames of each of our bicycles to carry clothes, cooking stuff, food and of course, copies of our two guidebooks, the accounts of Hannibal’s war against Rome written by the ancient authors Polybius and Livy. They were a heavy load – about sixty pounds including the bike – and we discarded lots of clothes and books as the journey progressed. Like Hannibal’s cavalry we were also surrounded by infantry. About thirty Spaniards from the local Carthaginian Association were there on the port promenade to give us a send-off, dressed up like the ancient Iberian warriors (allies and mercenaries in Hannibal’s polyglot army) with shields, shiny helmets and impressive axes and broadswords. They prepared to let out their bloodcurdling war cry and scream us out of town. Before we left the city, we’d had a chance to roam around its archaeological sites. However, the problem with Hannibal’s journey is that so far very little concrete archaeological evidence of his epic trip has been discovered. In Cartagena, perhaps the most impressive direct link to Hannibal is the Punic Wall Museum that opened a few years ago and showcases a large section of the defensive wall built by the Carthaginians in about 230 B.C. These excavated remains that once protected the landward side of the town, were built by Hannibal’s predecessor Hasdrubal and consist of fifty meters of a double thickness wall with space for rooms in between to lodge supplies and possibly even soldiers or elephants. It is still up to ten feet high in some sections and the sandstone blocks that made it are several feet thick. There are also hopes that excavations on a hill in the city’s center may one day reveal traces of the palace built by Hasdrubal, who was Hannibal’s brother in law and the founder of Cartagena. When Hannibal’s invasion force left the city in 218 B.C. it consisted of one hundred thousand soldiers, tens of thousands of horses, pack animals, thirty seven elephants and countless thousands of camp followers. Keeping all those mouths fed while on the move through hostile territory was an awesome task. Without the advantages of refrigeration and modern transport, Hannibal’s logistics team must have organized the equivalent of mobile farms to follow the army and thousands of civilians devoted to finding and preparing food. One of Hannibal’s advisers thought supplying food on this scale was impossible and suggested they accustom the men to cannibalism to ensure they never ran out! The horrific prospect of a man-eating army never came to pass. Our minor food issues were never anything like the sort Hannibal faced. But the night before we set off I decided it was wise to eat well and consumed what my brothers described as the biggest T-bone steak they had ever seen. We were a little worried that our peculiar television documentary combining bike riding and history might not actually work. But in the ancient ruins of Sagunto, near Valencia, it came together beautifully. This castle is so big it covers two neighboring hills and its perimeter wall, still intact, runs for hundreds of meters. In Hannibal’s time it was an Iberian fortress allied to the Romans and the site of a long and bloody siege. Inside the old walls where the surviving townspeople threw themselves into fires rather than be captured by Hannibal, there are now wastelands of dirt and dust where families of cactus plants cluster together. The castle’s protector, a rotund, dour, middle aged Spaniard, from his stone hut to watch us filming while puffing on a large cigar. With cameraman John rolling we rode up to the castle on our bikes, dismounted like ancient knights, hopped round the walls telling the story of Hannibal’s siege and then remounted our steads to leave the scene of battle. On that day, history and bike riding were perfect partners. There were moments on this ten week epic when incidents would trigger feelings that helped us really appreciate our incredible journey. At a campsite north of Barcelona, we’d just finished filming a Carthaginian style barbecue on the beach scene. A chef friend of mine, Adam Melonas, had prepared a baby pig on a spit stuffed with chorizo style and blood sausages (a bad day to be vegetarian), massive oysters and the biggest figs and peaches you have ever seen. This was a meal for the lucky, officer class. After sampling this feast we were waiting by the support vehicle when the campsite gardeners approached us. With genuine sincerity the two men told us they were very proud of what we doing because we were trying to share with others history and culture which they said was a very noble thing to do. It was probably the nicest thing anyone said to us on the trip. We left them the remains of our pig. At Ampurias, about one hundred miles north of Barcelona, we encountered our next archaeological Hannibal connection. This is the site of both the remains of the Roman town and next to it, right on the sea shore, the remnants of the most important ancient Greek colony in Iberian Spain, Emporion. As we filmed in-between its ruinous walls, the local archaeologist, Marta Santos Retolaza, told us that they have found evidence that the defensive walls of the town were reinforced in about 218 B.C, in anticipation of Hannibal’s arrival with his large army. We don’t know if Hannibal actually attacked the town to punish it for its known Roman sympathies, but it is just as likely he would have enjoyed calling in to meet the townsfolk. The Carthaginian spoke fluent Greek and was accompanied on his campaign by Sosylus, his Greek tutor. Arguably the most amazing feature of Hannibal’s Italian invasion was how he managed to get an army and nearly forty elephants over the Alps and into Italy. He did it at great cost – if the ancient sources are to be believed, by the time Hannibal was in the Alps he had about fifty thousand men with him. Nearly half would have perish from cold, hunger, or attacks from mountain tribes by the time he reached Italy. Which col, or mountain pass, he actually crossed into Italy is still a historical puzzle and experts – including Dr. Patrick Hunt at Stanford University – are trying to crack it. No conclusive archaeological remains of Hannibal’s crossing have been found so all we have to go on are dramatic descriptions of the journey by the two ancient authors, Polybius and Livy. Historians have extracted criteria from those descriptions to assess the viability of a mountain passes as a possible Hannibal routes. Those criteria include a white or bald rock where Hannibal is thought to have sought refuge with part of his army after an attack by hill tribes, an area below the summit within a day’s march from that bald rock where an army could camp and a spectacular view from the summit towards Italy that Hannibal used to inspire his men onwards. 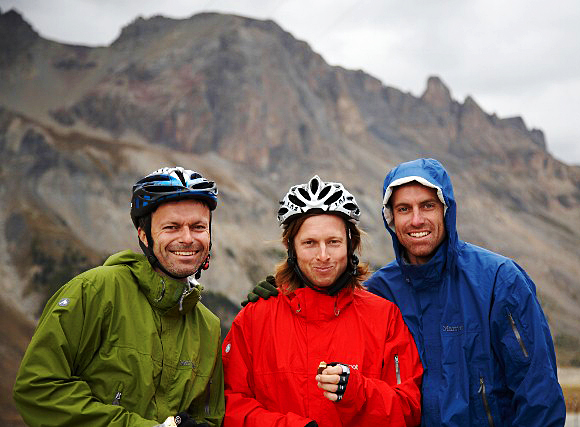 We split up and individually test rode three of the possible mountain passes. I took the easiest: Montgenevre, now a ski resort and a relatively casual climb to six thousand feet along a tarmac road. Ben took the Col de Clapier which involved the tricky task of pushing his bike for hours along a valley floor, some of it in the dark. 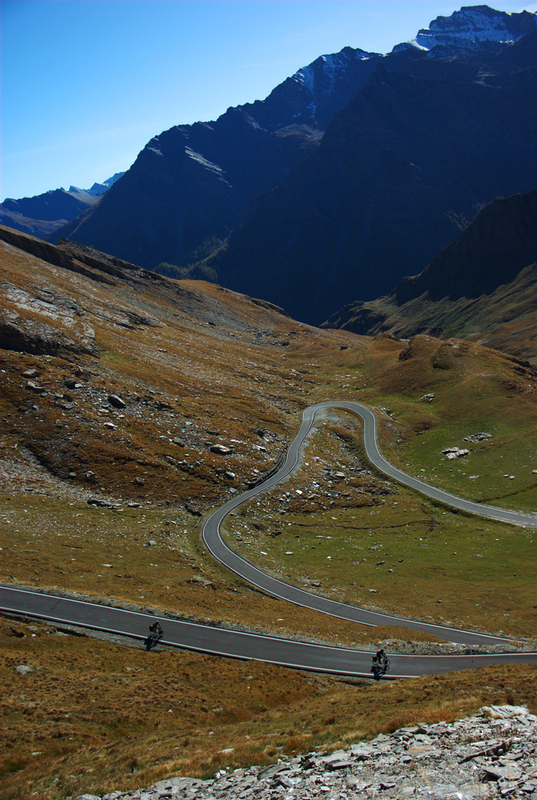 But Sam had the toughest assignment: Col de la Traversette. To test this mountain he dragged his bike up a rock face through snow and ice to a height of nearly ten thousand feet. By then I was safely drinking my hot chocolate and I’m still not sure how Sam managed it. One afternoon we finished filming in the Gorge de Gats – where Hannibal and his army could have been ambushed by hill tribes – and set off with another long cycle ahead of us. We’d had several extended days of filming and riding, not eaten much lunch and were desperate to stop for a snack – but there was nothing on the road. We kept riding up and down, up and down, increasingly tired and frustrated, and then we suddenly had this beautiful, curving, Alpine descent into a valley where a village almost seemed to twinkle to us from below. We rolled into the only cafe and enjoyed one of the best coffees of the trip. Polybius and Livy say Hannibal’s descent into Italy was very steep and our cycling down into Italy was also at surprisingly sheer gradient: a thirty mile freewheeling run, winding past Alpine creeks, a descents where your hands are so sore from squeezing the breaks that you have to stop and rest them. Hannibal was in Italy for fifteen years battling Roman armies but we only had a couple of weeks. During that time we rode through classic scenery in Tuscany where the combination of cypress and olive trees, vineyards and farmhouses made you feel like you were inside a Renaissance painting. We explored the key battlefields, from Hannibal’s first big victory in Italy on the Trebbia River near Piacenza, to his famous and crushing defeat of two Roman armies at Cannae near Lake Trasimeno, site of a third major victory, is well layed out with billboards that follow the progress of this battle where Hannibal destroyed another Roman force using the screen of the morning fog to achieve complete surprise. Near Naples, the city famous for its pizza and the Roman ruin of Pompeii we called in on Lake Averno. This is an extinct volcano crater that filled with water thousands of years ago and the ancients believed it was the entrance to the underworld. Hannibal made a sacrifice to the gods here, so we did too, using wine, honey, milk and cereal just like he would have – but leaving out the sacrificial lamb! 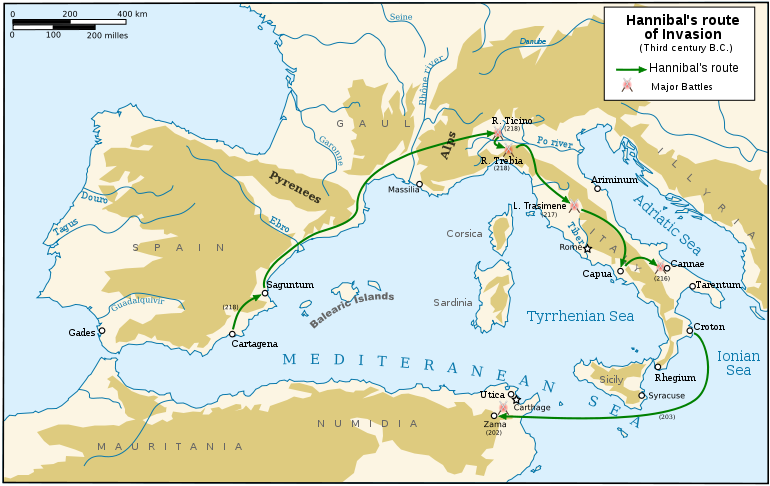 Along Italian coastlines we followed Hannibal’s desperate search for a port city that would have enabled Carthage, his home across the Mediterranean Sea, to send him adequate reinforcements. This took us to the town of Taranto where the desperate state of our clothes was becoming apparent to fashion minded locals. When not in bike gear we’d taken to wearing woolen hats, tracksuit tops, shorts and the slippers we’d kept from a hotel we’d stayed in during a rest day – all in the name of ensuring our bikes were carrying as light a load as possible. We probably looked something Viggo Mortensen in the movie, The Road, where he’s stumbling across frozen moonscapes in ratty, beggar like attire. The Tarentine locals would scan us up and down in horror. It’s a shame some of them don’t pay more attention to their local archaeology. Virtually invisible, beneath a fogged up perspex screen, the local tourist guide pointed out the remains of a defensive wall that was thought to have been built by Hannibal and his men to blockade the Romans inside the town’s citadel. The wall is mentioned in Polybius and Livy. Crotone in Apulia, on the bottom of the ‘heel’ of Italy was Hannibal’s last refuge before he was recalled to the homeland. There we visited another remnant from his campaign. On the edge a cliff, are the remains of an ancient temple of Jupiter. Polybius says he visited this temple to record the information on a plaque that Hannibal had fixed to one of its columns, detailing of his campaigns. Today there is only one column left standing and it looks like it may soon by claimed by the ocean.